In troubled times, art is more important than ever. Art can help to reflect and shape society, and perhaps no art does so as much as public art, which is a unique combination of method, location, and meaning. Public art, shared by all, serves to comment on or enhance our appreciation for the community, the environment, the landscape. Every public art project is a collaborative process, involving artists, community residents, civic leaders, and politicians. At its best, public art can raise quetions, challenge our assumptions, and add beauty to the world around us. 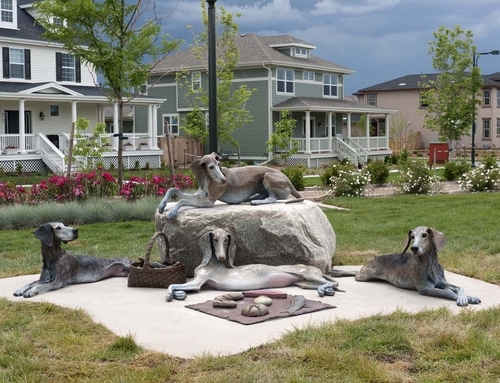 "My public artwork is site specific and uses everyday, often mundane materials in unusual ways. Much of the work incorporates 'family debris' materials, items used by and cast off by my family of five. In addition the materials are repurposed over and over again in new forms and installations, as components of future sculptures and art pieces. I enjoy the challenge of re-using, recycling, and transformation: looking at everything as a potential art material, as pleasurable penance for being a part of an over-consuming society: waste not, want not." 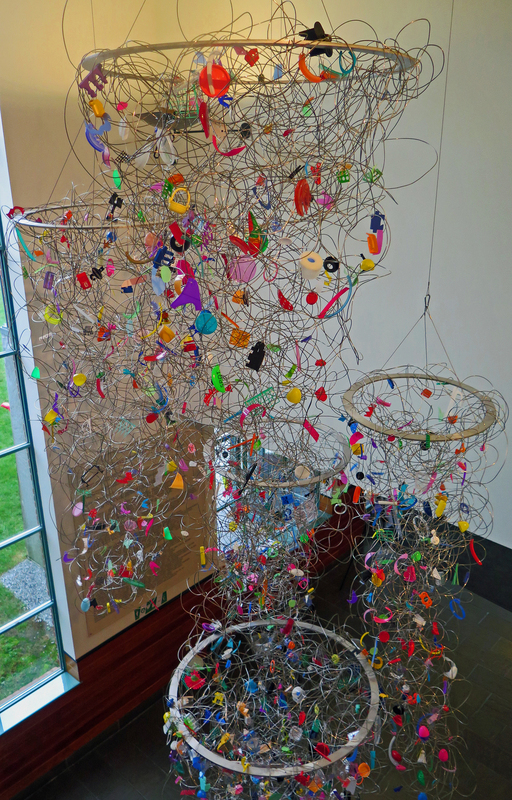 is a site specific sculpture installed in the Fitchburg Art Museum lobby, part of the Plastic Imagination Exhibition, currently on exhibit through January 15 2017. The five tornadic forms were created from aluminum rings, wire, monofilament and my family's recycled plastic debris. The forms represent my five family members' contribution to the plastic stew swirling about in the five gyres, where the world's ocean currents converge. The viewer is invited to appreciate the suspended playful and colorful forms as they capture the light from the expansive Museum lobby windows, and to pause to consider their meaning and the impact of plastic consumerism. 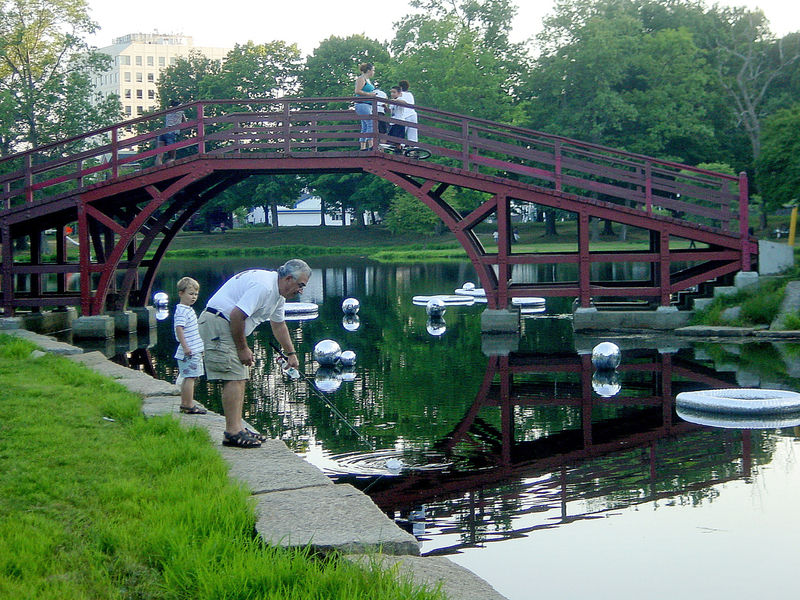 was a site specific kinetic environmental sculpture installed at the 2010 Art in the Park Exhibition in Worcester MA. Fifty seven floating silver rings and balls were created from aluminum duct tubing, mylar emergency blankets, recycled play balls and post consumer Styrofoam, tethered with nylon cord and submerged concrete blocks. Designed to represent amplified water rings and bubbles in motion and to catch the light, they invite the viewer to pause and appreciate the natural beauty of the Park's pond system. "The in-person experiencing of art is a different animal than the virtual experience. Physical presence takes up real space that you can walk up to and co-occupy. Strong art, like a glance at the sun, casts an afterimage, a ghost memory that burns indefinitely in your mind. This process happens most powerfully in person." Four bronze dogs having a picnic, a tableau in the mode of 19th century paintings on the subject, but with dogs in place of people. A beaver slaps the water with its tail, creating a large splash that shoots a ball into a high arc, which is caught 12 feet in the air by a leaping dog. The process is seen in stages, like stop action images from a movie, but in 3-D. The water is concrete and mica-embedded quartzite and reflects the nearby presence of Los Gatos Creek and Trail. 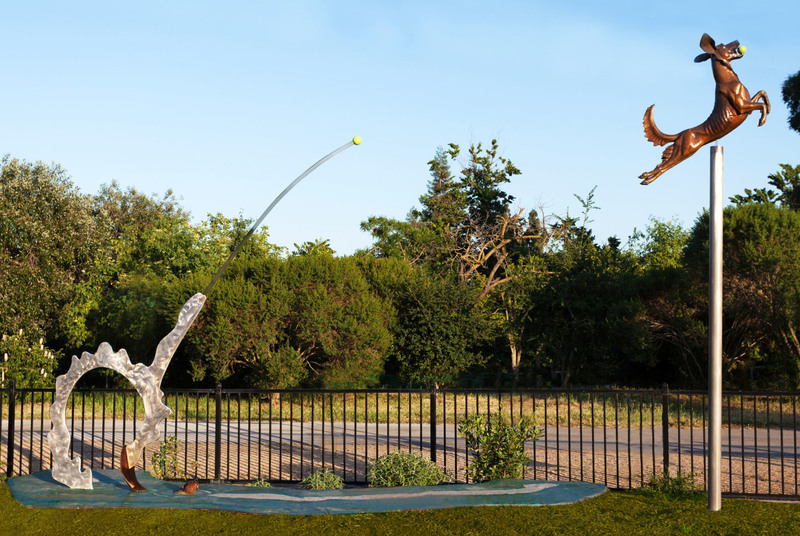 The dog leaps in the direction of Del Monte Park’s new dog park.